Additional Info: Table top ironing board, board games, smoke detector and carbon monoxide detectors. high chair and travel cot also provided. This a brand new caravan located in the Lakefield area of Haggerston Castle. It is a 5 minute walk from the main complex. Avoid the check in queues and go directly to the caravan. The holiday home includes open plan living and dining area with a 32" TV and DVD with freeview. We have left a few games for those quiet nights in. 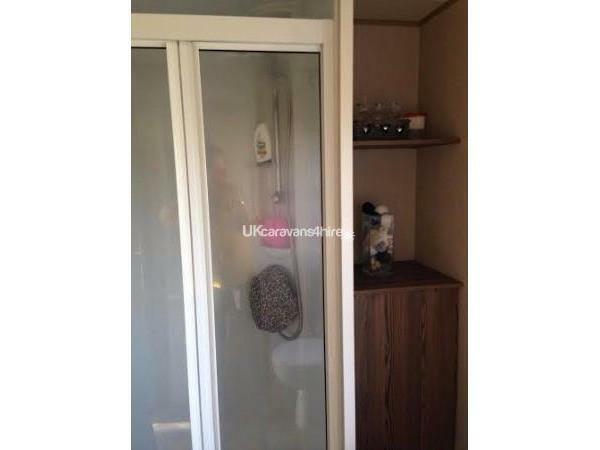 It comprises of a fully functioning kitchen with microwave, fridge, gas cooker, heating throughout, double glazing, shower with toilet, separate 2nd toilet, 1 double bedroom, 2 twin bedrooms, iron, counter top ironing board and hoover. Haggerston Castle offers a range of activities including 9 hole golf course, bowling green, tennis courts, Ariel adventure zone, 2 heated indoor pools, archery and much more. There is a lot of places to get a good meal, Burger King, Papa John's, Chinese restaurant and Mash and Barrel. There is a live lounge for your entertainment which offers live performances and your children's entertainment. There are a lot of tourist attractions close by such as Sea Houses, Alnwick gardens and castle, the historical town of Berwick Upon Tweed and you are only an hour away from Edinburgh. We ask that you leave the holiday home clean and tidy upon departure.